A mysterious black gable frames two new bedrooms on the roof of a house in the outskirts of Paris. Designed by French studio THE Architectes, the black-painted timber extension contrasts with the clay tiles and white render of the house's walls and roof. 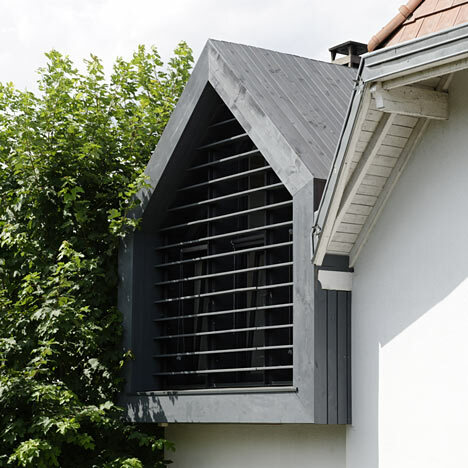 The slope of the gable matches the angle of the existing pitched roof. Skylights bring daylight into each of the new bedrooms and wooden beams are exposed on the ceilings. Horizontal louvres shade the window on the southern side, while the window on the northern side is left exposed. Photography is by Nicolas Fussler. This project in La Varenne Saint Hilaire by French office THE Architectes consists of a rooftop house extension to add two new bedrooms. The idea of the project was to put a new object over the existing house. All cladded in wood, the materiality of the extension really stands out from the masonry and the tiles of the existing house. Still the iconic pitched roof of the extension recalls the architecture of the existing house. Thus the project is clearly contemporary but is in relation with the existing architecture in a rather subtle way. The house is made in timber frame and all cladded in black wood. The southern facade is protected from overheating by horizontal wooden sun breakers also painted in black.